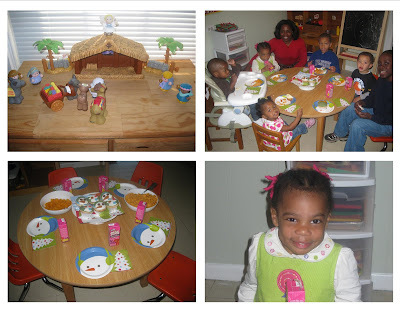 Handmade Mama: Happy Birthday Jesus Party! The Christmas Party at Kayden's daycare/preschool on yesterday was so much fun! I brought our Nativity from the house (Fisher Price Little People) and told the Christmas story using the characters. Then we sung happy birthday to Jesus including a candle that was blown out by every child...imagine lighting and relighting one candle six times :). What a wonderful opportunity to see the true story of Christmas through the eyes of children! Have a great day!